STAMPS: Spiral Whisper. INK: Airondack Pitch Black. 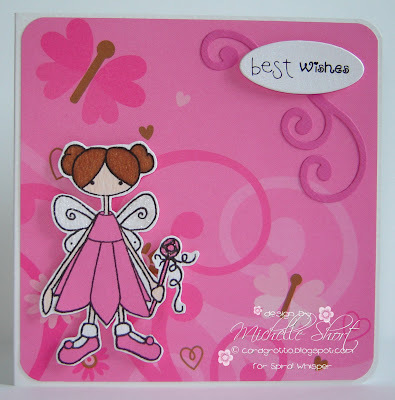 CS: Craftwork Cards, Doodlebug Designs, patterned paper by Doodlebug Designs. ACCESSORIES: Craftwork Cards Mini Message, Sizzix Scribbles Swirls Die, EK Success corner rounder punch, Copic At You Spica glitter pen, Copic markers. A great card all round Michelle - Well Done. Fab card Michelle, love the bright & vivid colours!! !